Are you tired of keeping tracking of your passwords? Are you fed up of putting your passwords on post-its on the side of your screens? 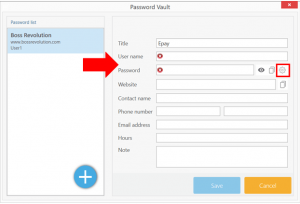 Worry no more as CellSmart POS brings you its very own Password Vault. In the latest update, this nifty feature has been added. This feature allows you to keep track of all your passwords. This Vault helps you store passwords for all your wireless portals such as Epay etc. A word of advice though, passwords will be visible to any employee with access to CellSmart POS so it should be used to keep secure information that is vital to share with employees but not to be used for personal purposes. If you have, any questions please do not hesitate to call us at (347)391-2600 or you can send us an email to info@cellsmartpos.com.